Hey, so I was actually having this problem on v3, but then through research found out v4 was out and I'm still having this problem. Basically, whenever there is white on the screen, it almost does the opposite of f.lux and gets brighter. And this just started to happen in the past week. It definitely has something to do with my monitor though, I'm just not sure how to fix it. I have two monitors, one on DVI and one on VGA. The VGA one works fine and has no problems with whites. The DVI is the one seeing the bright whites. My graphics drivers are updated (and not recently). And I'm not sure what else to do. I can take a picture of my screen if that'd help. If I take a screenshot it looks fine (but that's because f.lux isn't showing up in the screenshot). Do you have any sort of automatic/dynamic contrast adjustment setting in that monitor's menu system? Not that I can find anywhere. Also not sure if it makes a difference too, but sometimes it really artifacts certain pictures. For example, the mountain BG for gmail looks like a red hot mess. I think I may be in over my head, but I would bet the developer will probably want to see photos or maybe even videos of what you're seeing. It may be the only way to understand. Here's a photo of it in case. 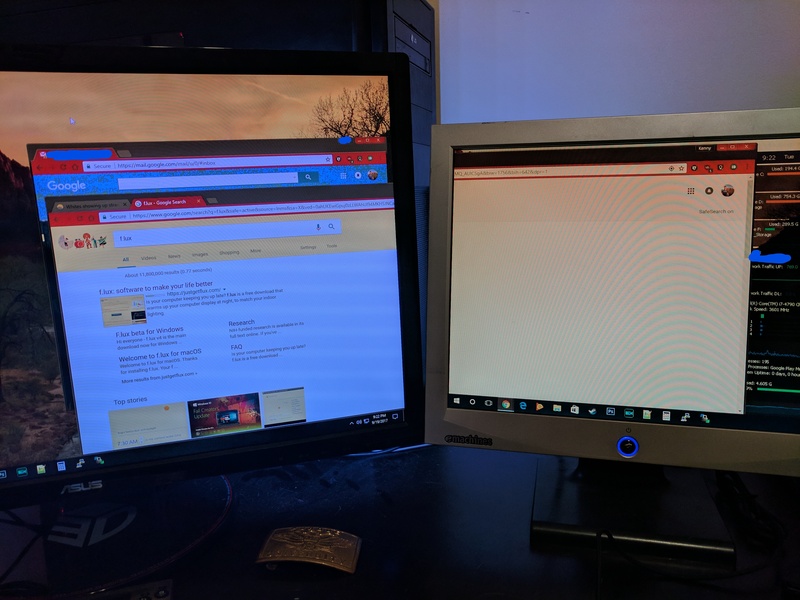 As you can see, on the right, the top bar of google (which is a whitish grey) displays fine, but the white of the body is vastly different between the two screens. And the gmail BG is artifacting pretty badly too. NVIDIA? There seems to be a bad driver around. @herf That was it thank you so much!